Gutter Cleaning is essential for every home. Learn how to clean gutters the quick and easy way and get the gutter cleaner. Plus learn what gutter cleaning tools you can use to make the job even easier. Find gutter rakes, cleaning wands, scoops and buckets. All you need to do the job! Learn what safety equipment you need and how to get started. Cleaning gutters is incredibly fun! Everyone knows gutter cleaning is important. Cleaning gutters is a job that must get done every year for most homes. 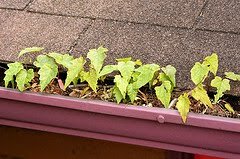 It can be difficult and tedious, because unfortunately not every one knows how easy or how much fun it can be when you know how to clean gutters. Yes it is fun. Being on a ladder or on a roof gives you an adrenaline rush and when you finish a tough gutter cleaning job you feel as if you have climbed Mt. Everest and back again. Be Safe, and learn proper gutter cleaning methods and you can have fun! Cleaning the gutters on your house is a great way to protect your investment. 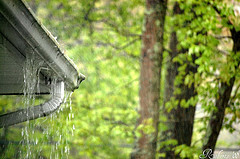 When they are properly working, gutters collect the water from your roof and channel it away from your home. Cleaning your gutters on a regular basis prevents them from getting clogged and over flowing. Clogged gutters can spill over into areas around your house and cause flooding and water damage. Gutters that are not cleaned regularly can rust through and then have to be replaced. This can be very expensive. There are really several tools you need to clean gutters. Let's look at each of these gutter cleaning tools listed in order of importance and explain why each type of tools is needed. The first tool you need is a good ladder. If you have a smaller build, I would suggest an aluminum ladder. If you have a bigger build, you may need a fiberglass ladder. Aluminum ladders typically hold 200 to 250 pounds. Fiberglas ladders hold 250 to over 300 pounds. Fiber glass is a little heavier than aluminum. In most cases a 24 to 28 ft ladder will work fine for 2 to 2 1/2 stories. It is also a good idea to have a ten foot a frame for getting on the roof on the first level. Other useful gutter cleaning equipment you might need include gloves, a square bucket with a handle, a gutter cleaning rake, and safety line and a safety harness for extremely high or steep roofs. A gutter rake is my favorite gutter cleaning toll. You can buy these for less then $25 dollars. b They can greatly speed up the time it takes you to get a job finished, allow you to reach around windows, and stay further away from the edge. They makes the job faster and less dangerous. You want to use a flat bucket, because it balance better then a round one. I usually upgrade to the most expensive equipment out there as soon as I can. A flat and a Phillips screw driver. A sealer for patching gutters or filling nail holes in the roof. In some cases, a wet dry vac can also be used to clean out the gutter. For the last two years I have been cleaning gutters in some of the richest suburbs surrounding Portland, Oregon. Nearly every house is situated on a steep hill surrounded by trees and a lot of these houses are in excess of 3 stories. After two years of gutter cleaning, most extreme sports don't seem very extreme any more. Portland is likely to be the hardest place on earth to clean gutters and we were extremely busy with our start up business Fall, Winter and Spring. This is the land of perpetual rain. And in the winter, you will often have the intensity of a tropical rainstorm, down around 35-40 degrees. We have a ton of deciduous trees and pine needles. I have learned that Pine needles fall year round and the Spring time blossoms can clog almost as many gutters as the leaves in the Fall. I this job. It is very fun and exciting. Every job is a new challenge and it is always fun finding new and inventive ways of gutter cleaning, that both save me time and increase my profitability. I will try and give you the best advice I can, but you also need to be extremely careful because gutter cleaning has many variables including wind, slippery roofs and frost bite. Always dress warmly and wear the proper safety equipment. Even though it is fun to work fast, you should never rush. Since 2008 I have been working on cleaning out gutters for a lot of customers. As a full-time landscaper come I always had plenty of work to do in the spring summer and fall, but I didn't really have a lot to do in the winter. So that is when I started cleaning out gutters. I have probably cleaned out over 500 gutters in the last few years. Every time I do the job it seems to get easier because I become more adept and because I keep buying better tools. There are two tools that I like to use that are not very expensive. I highly recommend these tools to you how is specially if you like to get the job done faster and you don't want to spend a lot of money to do the job right. The first tool is a gutter rake. The first time that I bought this tool, a little skeptical. I thought maybe it was just a lot-it wasn't not help out very much. But then I started using it, and I was surprised at how much faster and easier it was to clean gutters around the house by using a gutter rake. I quickly discovered that the standard 5 foot pole that they give you at the rake isn't enough. So I went to Lowe's and I bought a 15 foot extension pole. I think I paid $30 for it, and at the time I thought man I am just using up with the money here. Soon however, I realize that having a 15 foot extension pole could save me a lot of time, especially on the houses that were not that bad. The way most houses work is that there is usually one of the four side that is really bad, and the other three are not. Most of the time, it is the side on the back of the house that gives you the most trouble. By using a gutter rake an extension point was actually able to clean the front and sides of the house twice as quickly. The reason why save so much time was because I didn't have to go up and down the ladder once for every 6 feet of gutter. Rather, I only have a go up and down the ladder once for every 30 feet of gutter. It really made a huge difference. Another tool that I actually liked, I borrowed from a customer the first time I used it. It is called a gutters scoop. This tool only cost like three dollars, and it was definitely worth it. It really only saves a few minutes per house versus cleaning out the gutters by hand, but it keeps your hands from getting gross and covered in muck. Another advantage is that it also keeps your hands dry, which is a really good thing when it is wet and cold outside. I would definitely recommend a gutters scoop to anyone who has gutters to clean on a regular basis. There is a yellow scooper and a red one, the yellow one is really just a waste of money, you want to buy the red gutter scooper because it is much wider and works better on 80% of the houses. I have really enjoyed using a gutters do and a gutter rake to help me clean a lot of gutters. Why Are There Not Very Many Old People Cleaning Gutters? they go through life. (or at least rule out dumb choices) I started cleaning gutters when I was very young. 2. If I was not as young as I was, I never would have cleaned out some of the roofs that I did. It takes a lots of gusto to put forth the effort to risk your life to make only $150. When I worked as a gutter cleaner, I cleaned gutters in Portland Oregon. This is probably the most dangerous place in the world to clean gutters. It rained about 95% of the time. A lot of the roofs were covered with wet slippery moss. Not very much fun, but at the end of the day I feel like I had accomplished some great task. 3. Old people will get hurt a lot easier. During the last few years I have only fallen off of two roofs. But man do they hurt. At least I was using my safety line the first time. It caught me about halfway down and then slammed into the side of the house. Then I let go of my line and tell another 9 feet. It was not very much fun. I learned that even if the roof doesn't look icy on the south side, it doesn't mean that it isn't icy on the north side. clean out gutters,) don't have a very high life expectancy. I vividly remember two jobs I went to where the owners took time to point out me where the previous guys had fallen off the roof. For a minute I felt relieved that I wasn't the only one dumb enough to fall off a roof. Then I started thinking about how I needed to increase my life insurance just in case. While I am not one to be easily daunted by a hard task, I received a lot of extra encouragement from my wife and from my inner self to improve my life by starting a blog rather than spending all day cleaning out gutters. Now I am grateful that I made the change even though the first years of life cleaning gutters and blogging were actually very hard and difficult. How to Unclog a Downspout. Using a Gutter Rake to Clean Gutters. How to Clean Gutters in the Winter? Need a Gutter Rake or Gutter Scoop?